Packed with cinnamon, nutmeg, and allspice, these vegan Baked Apple Cider Donuts are a perfect way to welcome in the fall. 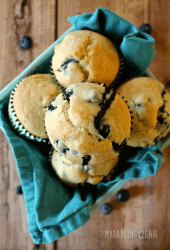 Made in just 25 minutes for a delicious treat. It’s Apple Cider Donut time! With the kids finishing the first month of school, temperatures beginning to drop, and the days getting noticeably shorter, I couldn’t be more excited. 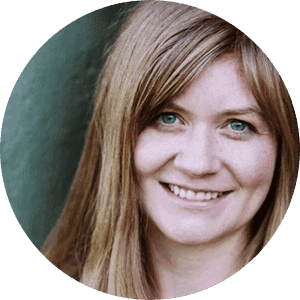 Fall is both a wonderfully nostalgic time for me, as I reflect on past years and old family traditions, while simultaneously representing new beginnings and fresh starts. There is a world of potential ahead of us! So, for the next few months, you will find me over here in pure bliss. But before I get too lost in the glory of it all, where were we? Oh right, Apple Cider Donuts! 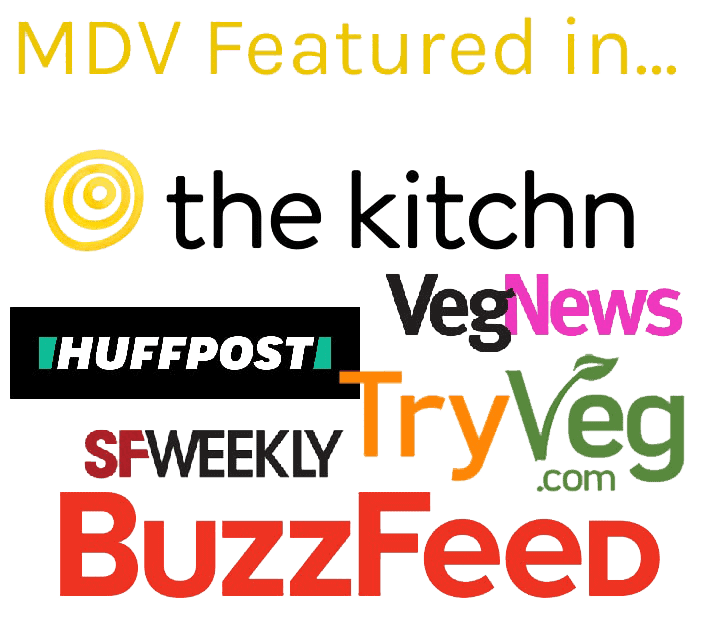 These Apple Cider Donuts are actually one of the very first recipes I made for My Darling Vegan. Way back in 2013, when my life looked drastically different, I first whipped up a batch. Despite the inconsistency of life, these donuts have been a constant. And you guys have loved them, too! So I figured it was time to give them a little makeover. Making baked doughnuts is incredibly easy and satisfying. 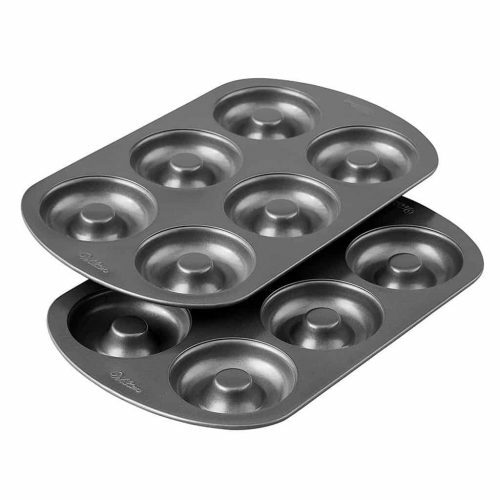 However, in order to make our own homemade vegan baked donuts, we first need to get ourselves a donut pan. Totally affordable. Just $13.50 for 2 on Amazon. So grab one today. I don’t want you missing out on donut season! 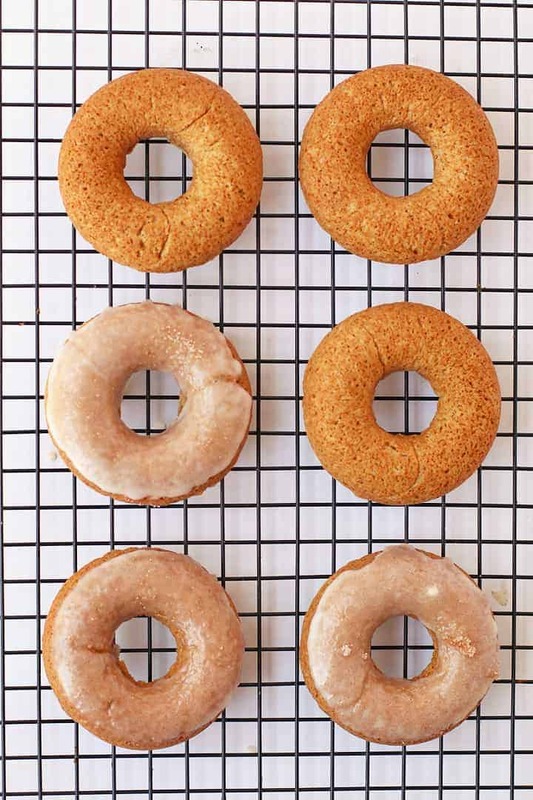 These apple cider donuts are so straight-forward it’s nearly impossible to get them wrong. The process is simple. Let’s take a step-by-step look. First, mix your dry ingredients together. Add the wet to the dry and mix until just combined. You don’t want to over mix or your doughnut will become tough rather than tender. Step two – Pipe your batter into your prepared donut pan. The batter will be soft, so a piping bag is the best option here. If you don’t have one, you can make a makeshift piping bag by pouring your batter into a ziplock bag, cutting off the tip, and piping from there. Bake the donuts for just about 8-10 minutes. When done the dough should spring back when gently pressed. Once the donuts are ready, pull them out of the oven and flip them onto a wire cooling rack. Let cool 10 minutes before dipping them into your glaze and sprinkling them with cinnamon sugar. This cooling time is necessary otherwise the donuts might crumble and the glaze will definitely melt off. Generously spray the donut pan before piping in the batter to ensure the donuts do not stick to the pan. For cleanest results, pipe in the batter with a piping bag. Let the donuts rest in the pan for 10 minutes before flipping them onto a wire cooling rack. Let donuts cool completely before dipping them in the glaze to prevent the glaze from melting. Donuts can be eaten immediately or stored in an airtight container at room temperature for up to 4 days. 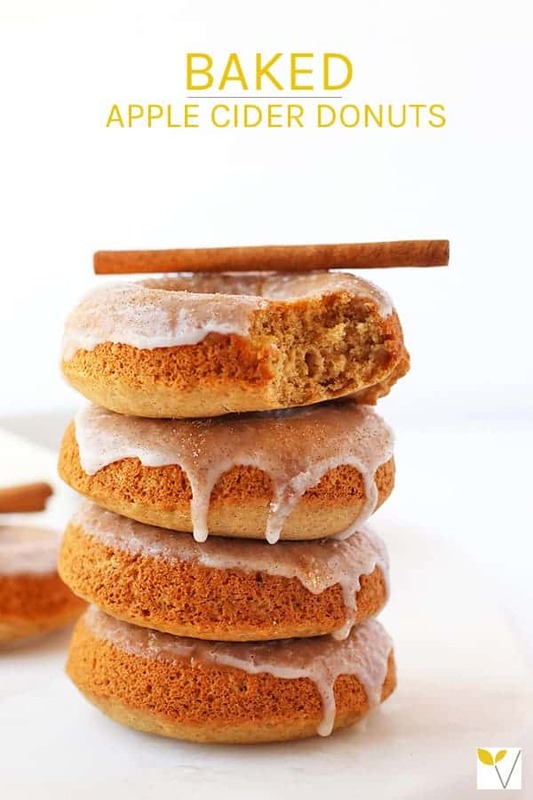 Enjoy these donuts with a homemade Chai Latte. 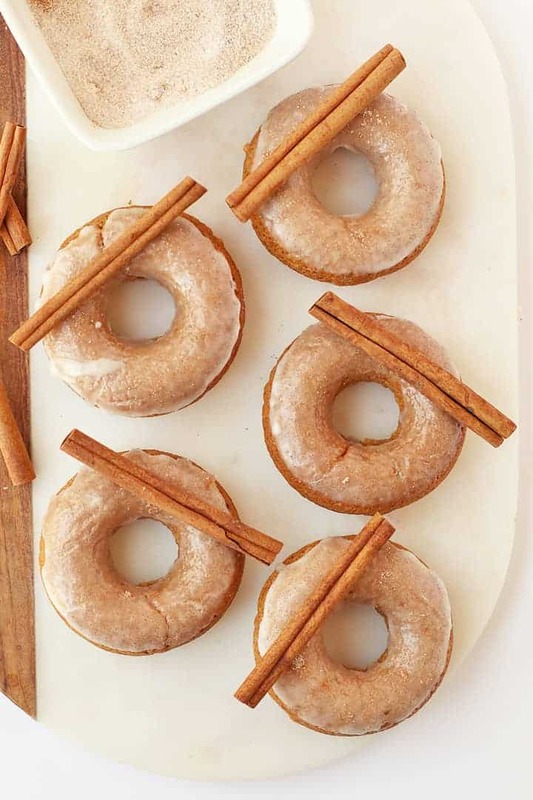 Not only are these Apple Cider Donuts nearly fail-proof. They are also delicious, tender, and incredibly quick to throw together. 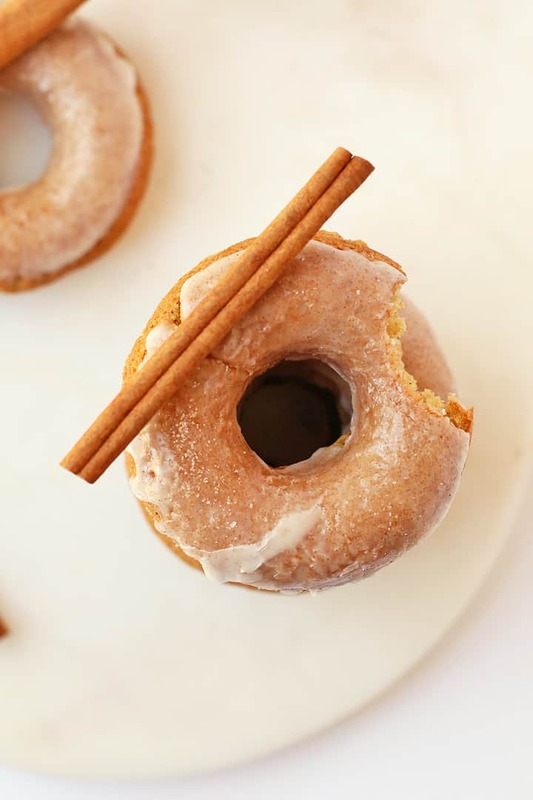 They can be made in just about 20 minutes for a soft and tender donut that is filled with apple and cinnamon flavors, making it the perfect treat to start off this fall. Packed with cinnamon, nutmeg, and allspice, these vegan Baked Apple Cider Doughnuts are a perfect way to welcome in the fall. 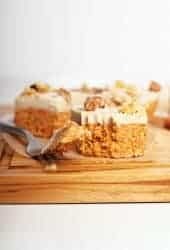 Made in just 20 minutes for the perfect autumnal treat. Preheat the oven to 350 degrees Fahrenheit. Spray a donut pan and set aside. 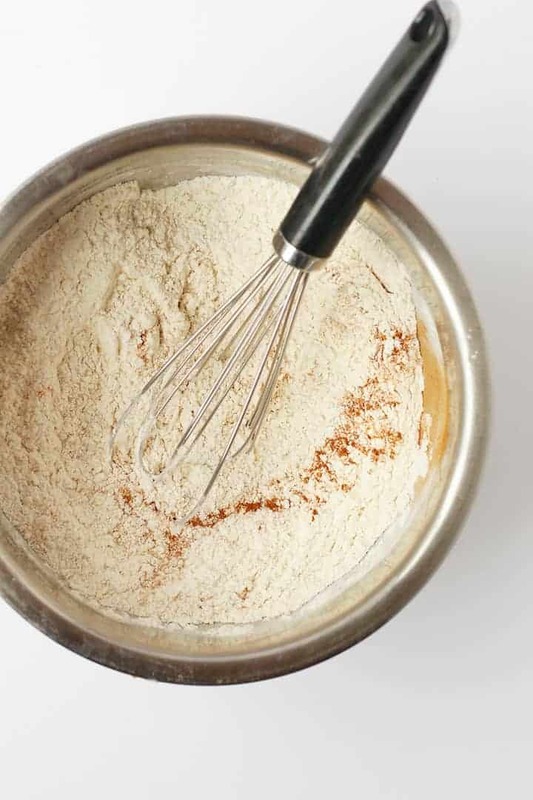 In a small bowl combine flour, baking powder, baking soda, spices, and salt. In a separate bowl whisk together maple syrup, apple cider, apple sauce, coconut oil, and vanilla extract. Add wet ingredients to dry and mix until just combined. Spoon or pipe batter into the prepared donut pan, filling each mold about 3/4 full. Bake for 8-10 minutes, until the donuts springs back when gently pressed. 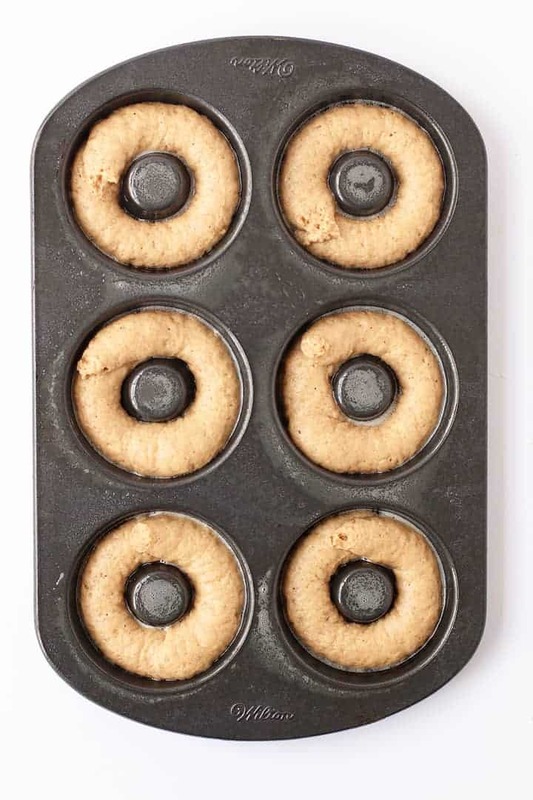 Remove from oven and let cool in pan for a few minutes before transferring doughnuts onto a cooling rack to cool completely. To make the glaze, whisk together powdered sugar and apple cider in a small shallow bowl. In a separate bowl, combine ingredients for cinnamon sugar topping. If you give these donuts a try, let us know what you think in the comments below. Or snap a photo and share it on Instagram. 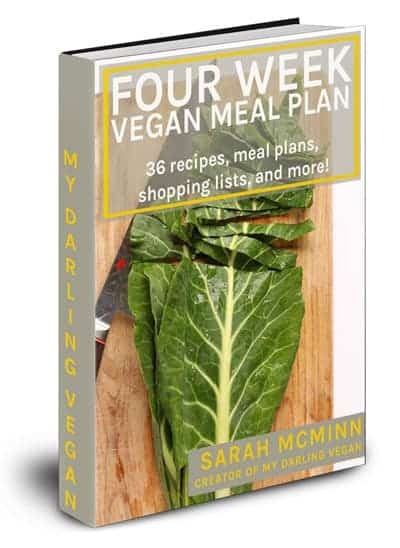 Make sure to tag @mydarlingvegan so I can see your creations! Just tried them and I love the taste but unfortunately the consistency turned out to be like a browny and very dense not as fluffy as a donut should be. I used honey instead of maple syrup maybe that’s the fault but I will try them again as the taste is SO good! Just made these, had such a craving but no apple cider so chopped up two small macintosh apples and added a tiny bit more applesauce, also too lazy, oh well, to melt the oil so used vegetable oil. what a yummy , moist recipe!! Do you think these would fair well being packed and brought camping? What is the best way to store these if made ahead of time? Yeah, I think they would be fine. To pack them, let them first cool completely, then just pack them in an airtight container. They should be kept at room temperature. Enjoy! Made these yesterday and they’re so delicious! Had to substitute EVOO, as I can’t have coconut oil, and didn’t notice a difference. Made double the batch to share and coworkers are already requesting more! Made these yesterday and they were DELICIOUS! Doubled the recipe for sharing and couldn’t find apple cider so substituted some apple juice and lemon juice- can’t wait to make again! Can I leave the oil out? I don’t ever buy oil anymore and do t want to start! I’ve never made it without the oil. You couldn’t do it without substituting it for something else (without significantly changing the texture) and I don’t know what to recommend without personally trying it. Just made these yesterday, and have to say they were absolutely amazing! Thank you so much! For reference for other folks, I used fresh ground wheat: 4 oz of soft white and .25 oz of hard white. A bonus was that the 6-donut pan fits in my Breville Smart Oven, so no need to heat up the big oven. 🙂 THANKS AGAIN!! These are so good!!! I am not vegan but try to eat fairly clean and liked that the base recipe used only maple syrup vs refined sugar. I did reduce down a cup of apple cider so it was more of a syrup. Also I used a 1:1. Gf flour, avacado oil instead of canola and dusted with some coconut Sugar with cinnamon and no glaze as these were for younger kids and less sugar is better 😉 they were delish! Wow! I don’t know what I did but they turned out more than bad. They tasted like flour and vinegar only.. I had to throw them all away. Unfortunately, these did not work for me. The mixture baked, but turned out the consistency of a dense muffin. They did not taste like, or resemble a donut. I had to throw them out. I also had to cook them for longer than the recipe stated because they were still very pale and uncooked after 8-10 minutes. I’m sorry to hear that. Without more information I’m not sure why that would have happened. 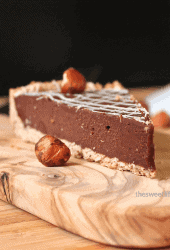 Would this work with coconut flour or almond flour? And is there any sugar substitute I can use?